The Air Force is proposing a large funding increase for the missile warning satellites known as the next-generation Overhead Persistent Infrared. WASHINGTON — The U.S. Air Force is requesting $13.8 billion for space programs in its fiscal year 2020 budget. That is $2 billion, or 17 percent, more than the $11.8 billion that Congress enacted for fiscal year 2019, officials said on Tuesday. Most of the space portfolio — about $10.3 billion — funds the development and procurement of space technologies like satellites, ground systems and launch services. The remainder covers personnel, training and operations costs associated with space activities. 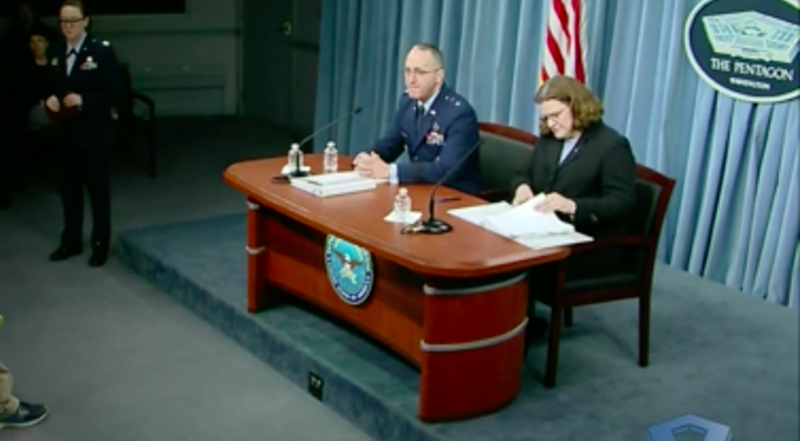 The majority of the increase requested for fiscal year 2020 is to accelerate the development of next-generation satellites, Air Force budget deputy Carolyn Gleason told reporters at the Pentagon. “We’re growing RDT&E,” she said. That is the account that funds research, development, testing and evaluation of new systems. The biggest beneficiary of the RDT&E boost is the constellation of five missile warning satellites known as the next-generation Overhead Persistent Infrared, or next-gen OPIR, that is being developed by Lockheed Martin and Northrop Grumman. The Air Force in 2020 is doubling the funding for missile warning satellites with a request of $1.6 billion — $1.4 billion for RDT&E for next-gen OPIR and about $200 million to continue to procure the existing missile warning satellite constellation known as Space Based Infrared System. For fiscal year 2019, Congress enacted $703 million for RDT&E for next-gen OPIR and $108 million for SBIRS procurement. The Air Force had to add more money into the OPIR program as it is trying to compress a nine-year schedule into five years. “The next-gen OPIR will rapidly deliver strategically survivable missile warning that counters adversary advances in missile technology and counter-space systems with added resiliency features,” according to budget documents. The budget also funds a new ground system for OPIR known as the Future Operationally Resilient Ground Evolution, or FORGE. The Air Force is requesting $1.7 billion for the GPS 3 program. It is funding the procurement of the first GPS 3F follow-on variant made by Lockheed Martin, the OCX ground system for GPS 3 made by Raytheon and user terminals made by L-3, Collins Aerospace and Raytheon. The budget also seeks $1.1 billion for satellite communications. That includes a mix of programs: Protected Tactical Satcom, Evolved Strategic Satcom, the recapitalization of the Enhanced Polar System, and funds for on-orbit testing of Advanced EHF communications satellite AEHF-5 and production oversight of AEHF-6. The primary contractors for satcom programs are Boeing, Northrop Grumman and Lockheed Martin. There is $1.6 billion in the 2020 budget for space launches under the National Security Space Launch program (formerly known as Evolved Expendable Launch Vehicle). That is a reduction from $2.1 billion for five launches that Congress enacted for fiscal year 2019. The 2020 budget request includes $1.2 billion for four NSSL launches and $400 million of RDT&E funds to be spent on cost-sharing agreements with commercial launch companies that are seeking to certify their vehicles for national security launches. The larger funding request for military space comes as the Trump administration continues to make a big push to get congressional authorization to stand up a Space Force. The president’s $750 billion national defense budget request for fiscal year 2020 includes $14.1 billion for space programs. In addition to the Air Force’s $13.8 billion portfolio are $306 million to establish three new organizations: a U.S. Space Force, a Space Development Agency and U.S. Space Command. It is not clear why the Pentagon’s budget documents released on Tuesday did not detail any space investments by the Army or the Navy. A DoD spokesman did not respond to questions from SpaceNews about what exactly was counted in the $14.1 billion request for space. The budget request includes $72.4 million for 160 billets to establish the Space Force headquarters (120 would transfer from other services and 40 would be new hires). The budget also proposes $83.8 million to stand up U.S. Space Command and $149.8 million to establish a Space Development Agency. To staff U.S. Space Command in fiscal year 2020, DoD will transfer 587 military and civilians from the National Space Defense Center, the Joint Force Space Component Command, the Joint Navigation Warfare Center and other organizations. These units currently report to U.S. Strategic Command. The Space Development Agency will be dedicated to “rapidly developing, acquiring and fielding next-generation space technologies,” the budget documents say. The SDA will be placed in the office of Undersecretary of Defense for Research and Engineering Mike Griffin but will transition into the Space Force if and when the new branch is established.